I’ve already traveled the length of the United States just to eat a burger; this time I was motivated by a different type of food. With a history as deep rooted and as smooth as the Jazz that was played around it, I could not consider myself a true follower of the food without giving chicken and waffles mad-kluckit respect by visiting and eating at two of the most famous chicken and waffle restaurants in the United States: “Gladys Knight and Ron Winans’ Chicken and Waffles” in Atlanta, GA and “Roscoe’s House of Chicken and Waffles” in Los Angeles, CA . As a city deeply rooted in the history and tradition of the south, Atlanta was primed to become a hotbed of this tasty concotion. In a story true to the food’s history and the city’s reputation for music, Atlanta’s #1 chicken and waffles restaurant was founded by an amazing singer. Gladys Knight was declared the “Empress of Soul” by the Society of Singers in 2007, won/co-won four Emmy’s throughout her career, and earned a star on the Hollywood walk of fame, but amidst the craziness of her illustrious career she was able to create one of the most amazing chicken and waffle restaurants in the United States. Which of her accolades is more impressive is up to you, but as a fat food fanatic I think you know where I stand. 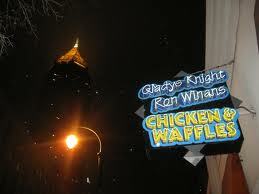 Gladys Knight’s recently saw the limelight in 2009, appearing on an episode of the food-god himself, Man vs. Food. Herb Hudson, a Harlem native, brought chicken and waffles across the states to the city of Los Angeles when he founded Roscoe’s House of Chicken and Waffles in the mid 1970’s. The restaurant’s popularity quickly became apparent when it was mentioned in the movies Tapeheads, Swingers, Rush Hour, and Jackie Brown and supported by celebrites such as Snoop Dogg (who took David Beckham and Larry King on his reality show), Ludacris, and the Notorious B.I.G. Gladys Knight’s took my expectations, turned them upside-down, deep fried them and then blasted them in the face with a pile of melted butter. From the minute I walked into the restaurant I knew I was in for a treat. The place was clean and decorated very tastefully with all sorts of music memorabilia that, combined with the dim lights and the smooth soul music in the background, dared your mind to imagine the vibrant, Jazz-filled restaurants of Gladys’ time. Friends and families sat around tables joking and laughing as staff whisked in and out of the kitchen bringing plates of mouthwatering food all while humming a tune. The menu was far more creative and extensive than I could have imagined and I almost regretted that I had to order the classic chicken and waffles for comparison purposes. My regret was immediately withdrawn as I was informed of the specialty waffles with which I could accompany my crispy cluck friends. Based on the waiter’s recommendation I settled on the Apple Cinnamon waffles over the Pecan and Chocolate Chip options, and I was not disappointed. Though the bigger than thou plate of food challenged both my will and mental strength, causing my brain to remind me that I had just eaten only hours before, I was forced to throw it a gigantic metaphorical middle finger on behalf of my taste buds who were begging (and bribing) me to finish every last scrap of food. Fueled by the endless streams of grease and a gigantic Arnold Palmer (which was provided free of charge since our request for a beer led to the enlightening knowledge that the restaurant does not serve alcohol) I finished my plate, exited the restaurant, ignored a homeless person, and took a cab to the hotel before succumbing to a mild coma. Forgot to take a picture of Roscoe’s. Looks pretty much like this except more food and not as classy. If there’s a line outside of your restaurant, you know it’s worth waiting for. I stood on the sidewalk trying to imagine how Roscoe’s could even come close to Gladys’, once again my doubts were put to rest. While not as “upscale” as Gladys’, Roscoe’s had an extremely authentic feel. You knew they were in it for the chicken and waffles. While I scanned the menu, trying not to be distracted by the amazingly delicious sounding drink items, I noticed that there was a “classic” twist on the classic chicken in waffles, and by classic I mean there was an option to smother them in gravy and onions. It’s as if they knew me. 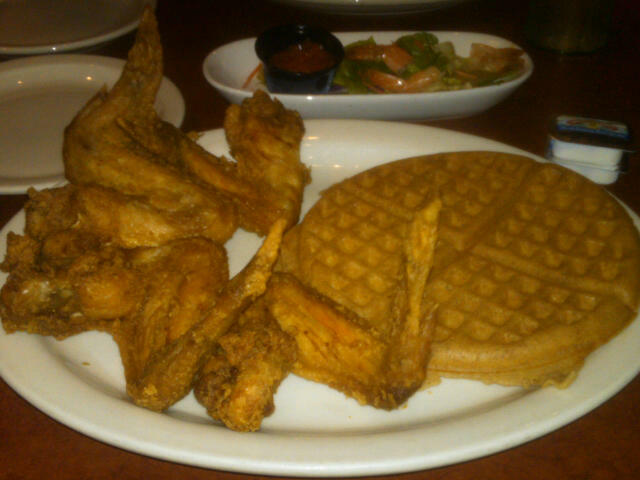 The chicken was amazing and the waffles tasted like a buttery slice of heaven. I didn’t even come close to pounding down the monstrous lake of gravy whose gravy tension was only pierced by rising mounds of chicken sitting on waffle foundations, but I can tell you that the leftovers were just as scrumptious. Though I ate Roscoe’s after being awake for only four short hours, again I was quickly overtaken by the burning desire to plant my face into my pillow. It may have been the fryer or possibly the gravy, but something about Roscoe’s chicken just did it for me. It even tasted good as a cold leftover. I mean seriously, the options of Apple Cinnamon, Chocolate Chip, Pecan, and Regular just doesn’t get any better. My only regret is that I didn’t order one of each. Gladys’ menu was nearly four pages long to Roscoe’s two and contained a wide variety of combinations and a list of sides (of which the mac and cheese and collared greens were great). Maybe it was the Jazz music, maybe it was the more helpful staff, or maybe even the decor, but Gladys’ just felt like a place to be. The hustle and bustle of Roscoe’s may just be a by-product of the f*%k fest that is Los Angeles but it’s all part of the game. With a KluckIt rating of 9.5/10, and a 3-1 victory over Roscoe’s, I declare Gladys Knight and Ron Winan’s Chicken and Waffles the greatest chicken and waffles in the United States. Have any other foods you think I should be comparing? Suggest here. 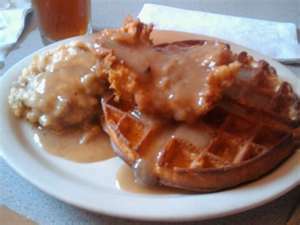 Holy schmolie, my arteries are hardening just thinking about chicken and waffles. It’s great that you’ve been to the Mecca(s) of C&W: L.A. and Hot-lanta! Beats mom’s home cooking, that’s for YAM sure! Never ever had chicken and waffles together, but now I’m determined to do just that. I’m actually from Atlanta, so go figure. Next time I’m there…..I’m there! Woohoo I was waiting for this post. YUM let’s go back soon! Lol there’s a reason they have a security guard outside somehow that doesn’t make me feel safe. You should try zankou chicken. 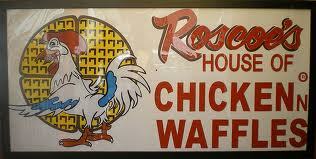 They say the chicken is way better than roscoes.